Co-registration refers to the simultaneous recording of multiple data streams. Co-registration of eye tracking data and other data streams helps, in some experiments, to get a better understanding of human behavior. 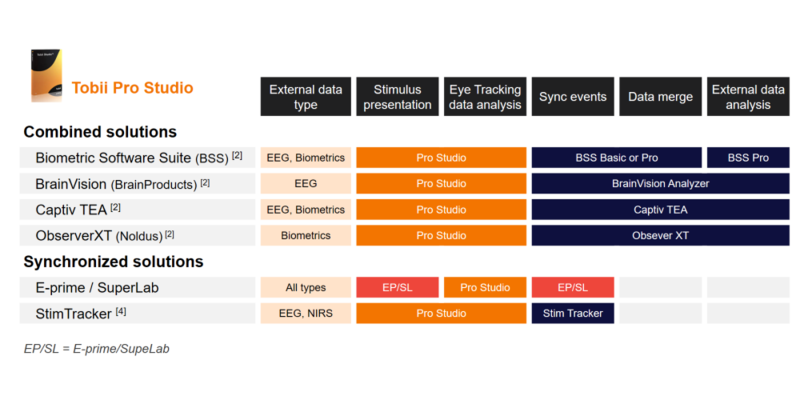 The most common data streams that are recorded simultaneously with eye tracking are EEG, biometric measures such as GSR, ECG or EMG, and motion capture measures. There are two main points to consider when we want to co-register eye tracking with another data stream; the recording setup and the analysis of the data streams. During the recording phase, it is important that the co-registration solution ensures that the data streams will be synchronized in time. During the analysis, it is also important that the co-registration solution allows you to run the type of analysis and get the metrics that you need to answer your research question. Thinking about these two points before starting your experiment will help you choose the best co-registration solution for your needs. 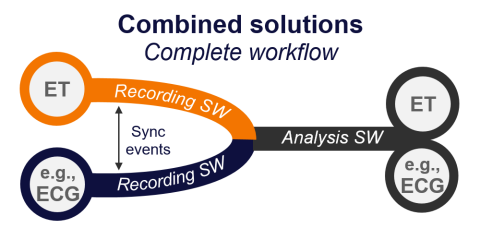 Integrated recording and analysis: With this type of solution all the data streams are recorded and analyzed in one software program. 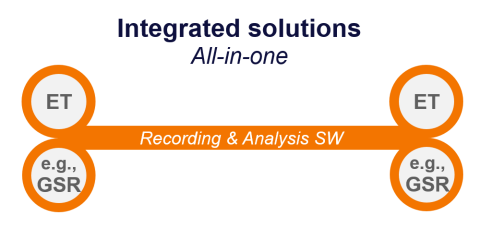 Integration solutions are most suitable for users who want to record and visualize their synchronized data streams together and run standard combined analysis. 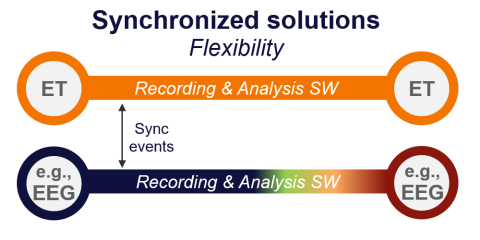 Synchronized recording: This type of solution ensures that the data streams will be synchronized based on common events sent during the recording. Synchronization solutions are the most flexible ones and are compatible with many external devices and manufacturers. Combined analysis: This type of solution will also ensure that the data streams will be synchronized for later analysis. In addition, the solution includes a software program that will merge the eye tracking and data streams and will offer advanced analysis tools for your external data. The available solutions for co-registration of Tobii Pro eye tracking data with other data streams will be mainly determined by the eye tracking recording software that is used. 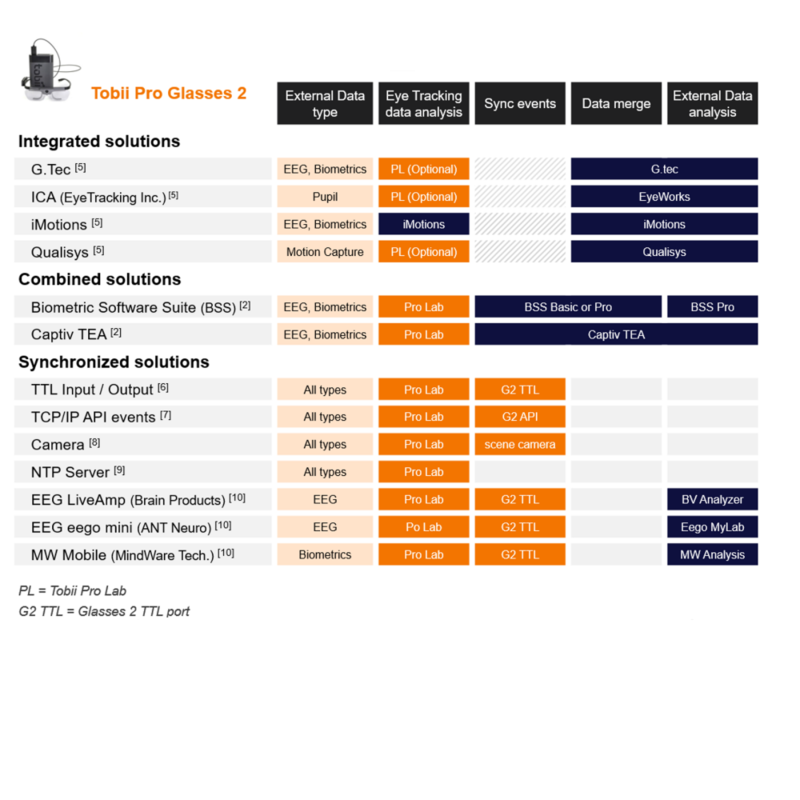 In the following tables, you can find an overview of the available Tobii Pro solutions for co-registration of screen-based eye trackers with other devices split by recording software. You will also find a table dedicated to co-registration solutions when using our wearable eye tracker, Tobii Pro Glasses 2. – Tobii Pro Lab integrates Shimmer3 GSR+ with screen-based Tobii Pro eye trackers. 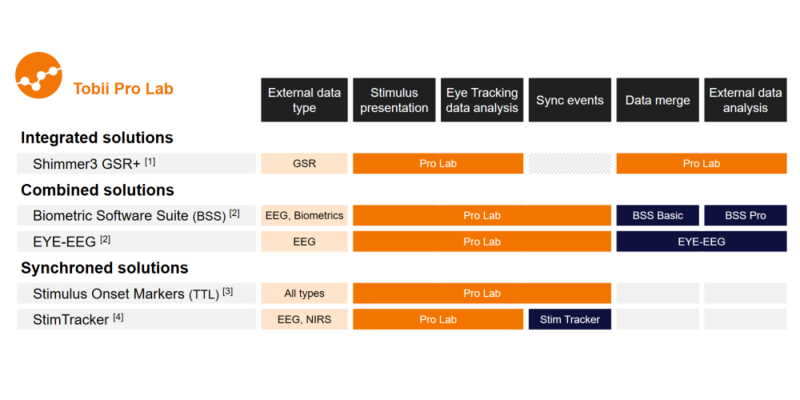 Tobii Pro Lab records, analyzes, visualizes and calculates metrics of GSR data and eye tracking data. 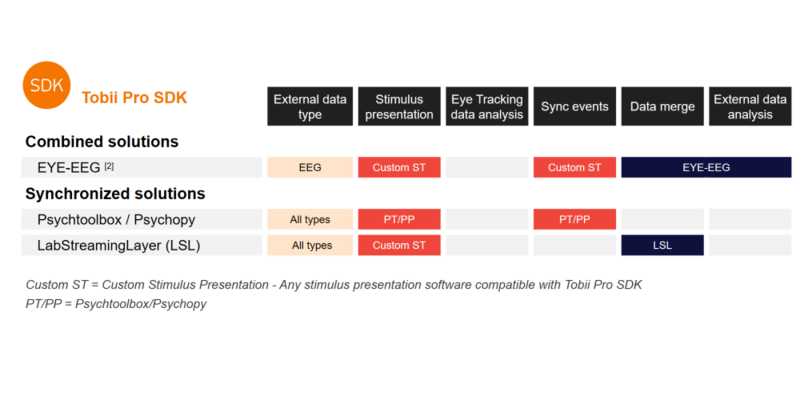 – The third-party software packages that offer combination solutions compatible with Tobii Pro eye trackers are capable of synchronizing and merging Tobii Pro eye tracking data with other data (e.g., EEG). In addition, some also offer analysis tool for GSR, basic EEG and HR analysis (Captiv TEA and BSS) or advanced EEG analysis (Brain Products and EYE-EEG). – Tobii Pro Lab sends accurate TTL events at the onset of every stimulus to any external device with a TTL input port. – StimTracker (Cedrus®) is a hardware device that sends accurate TTL common events to the eye tracking and external data based on a light sensor attached to the stimulus monitor. 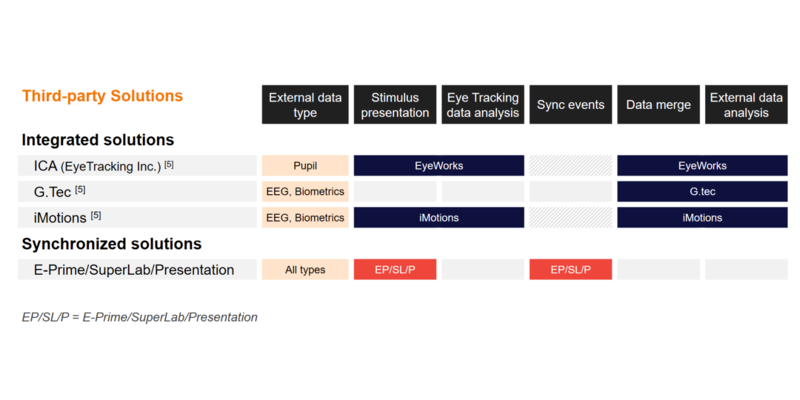 – The third-party software packages that offer integration solutions compatible with Tobii Pro eye trackers are capable of recording and merging eye tracking data with external data (e.g., EEG). In addition, all offer analysis tools for the external data and some also offer eye tracking data analysis tools (iMotions and EyeTracking Inc.). port compatible with LVTTL (3V). The Glasses 2 recording unit is also capable of receiving 1-bit TTL events during the recording (max. 5V). The events can be used to timestamp important events during the recording, or to synchronize Glasses 2 with other biometric data streams. –Glasses 2 are able to receive TCP/IP events using the Glasses 2 API. The events can be used to timestamp important events during the recording or to synchronize Glasses 2 with other biometric data stream from any custom application created by the user (e.g. Matlab, Python). – Camera events are the easiest way to create events in the Glasses 2 data stream. Any visual event can be recorded with the Glasses 2 scene camera. After the recording, the events are manually marked and added to the eye tracking data stream. –The Glasses 2 clock can be synchronized with an NTP server. All the external devices that share the same clock can be automatically synchronized based on the recording stat timestamp with a second precision. – The third-party hardware packages that offer synchronization solutions compatible with Glasses 2 include a synchronization cable that connects the Glasses 2 recording unit and the external device recording unit, ensuring a wireless setup and 1-bit common events in the eye tracking data and external data.